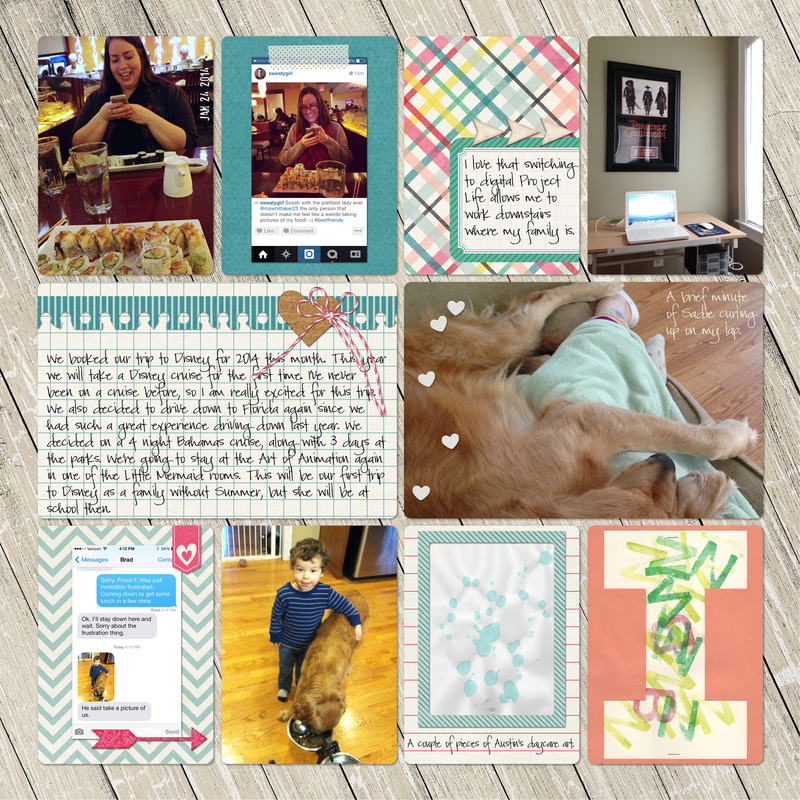 It's February blog circle day, and today I'm sharing with you a layout I'm really excited about. 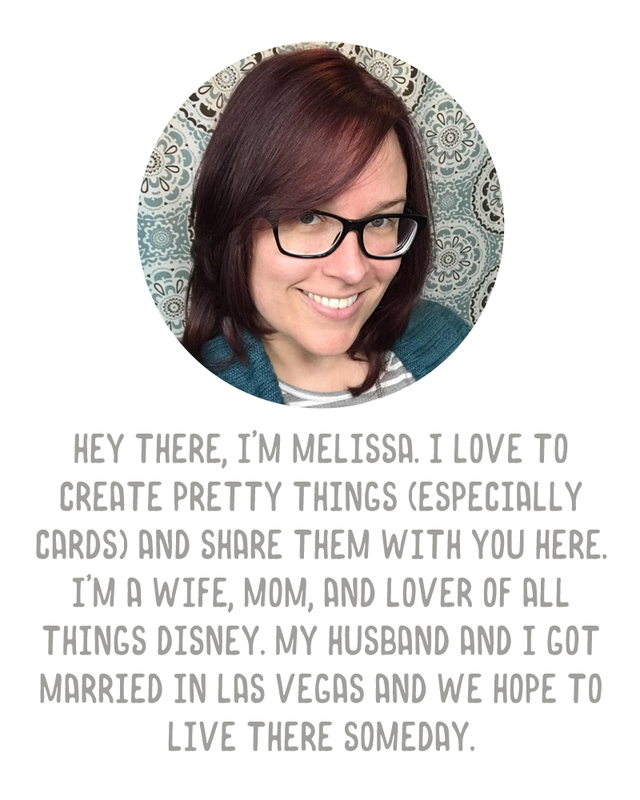 You should be coming to me from Melissa's blog, LooDeLoop. I'm struggling with what to call my 2014 album. Meaning...is it really "Project Life" or should I be referring to it as "Pocket Scrapbooking." I know that Becky Higgins has a trademark on Project Life, but most people generally refer to their pocket scrapbooks as Project Life even if they're not using her products. The term "Project Life" seems to be less about a specific line of products and more about the style of scrapbooking. I use a mix of products - I have lots of Becky's products and lots of miscellaneous digital products, and I don't know what to do about that. For now, I am sticking with referring to my album as a Project Life album, because Becky's products are what got me started with this style of scrapbooking. I want to always give her that credit. But I'm sure you can understand my struggle, especially as this week I didn't use any of Becky's products. I'm still fighting with myself over the background papers, but I think they've won me over. I really like the addition of a paper behind these pages. It just makes them look finished. I really played with embellishments and extras for these pages. I'm still learning what I like with regard to the digital process, so I wanted to take some time and try some different things. My process for these pages was pretty straight forward - I chose my pictures first, then I chose the best template for the photos I'd chosen. Then I filled the spots with photos first, then the journaling cards and papers. Finally, I added embellishments and journaling by going from pocket to pocket. This just works best for me. Up at the top, I added the date to the photo of Shannon at our sushi dinner. I don't date every photo but I do like having the date on one or two within a spread. I think that's plenty enough for me to know when something occurred. 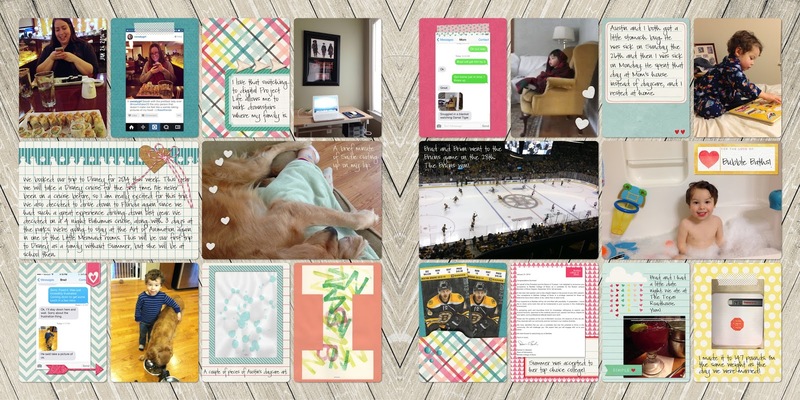 I added a screenshot from Shannon's Instagram with a picture of me, and used some digital washi tape from Anita Designs over it. The dark teal paper for my card is from Kim Broedelet. I included a photo of where I've been doing my spreads lately, in the corner of my livingroom. I used some paper from Juno Designs, along with a journaling card (turned into a label) from Deena Rutter. The wood arrows are from Traci Reed from the May 2013 That's Life DigiScrap Parade (no longer available, I believe). I did a large journaling card this week in one of the 4x6 pockets. To make this, I used paper from Dawn By Design, and layered it with the notebook border from Melissa Bennett, and a cork heart and baker's twine bow from Pixels & Company. In the bottom left corner, I tried out a little something new for me. 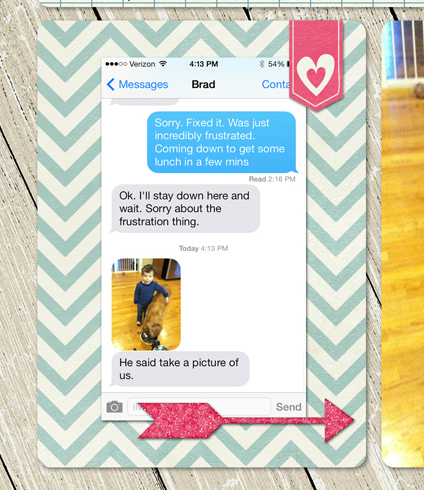 I wanted the flag part of this journaling card from Stolen Moments to be on top of the screenshot of my text from Brad. What I did was use the Magic Wand tool in PSE, and select that entire flag. I copied the selection, created a new layer above the screenshot, and pasted it. Then I added a little shadow to the flag. So easy. After that I just added an arrow from Allison Pennington. A couple of other items used on that left page were sparkly hearts from Allison Pennington, a lined card (which I enlarged because I didn't want to use the top of that card) from Stolen Moments, and a frame for Austin's artwork from Scotty Girl Design. Up at the top left I used some washi from Juno Designs over some pink paper from Mommyish. 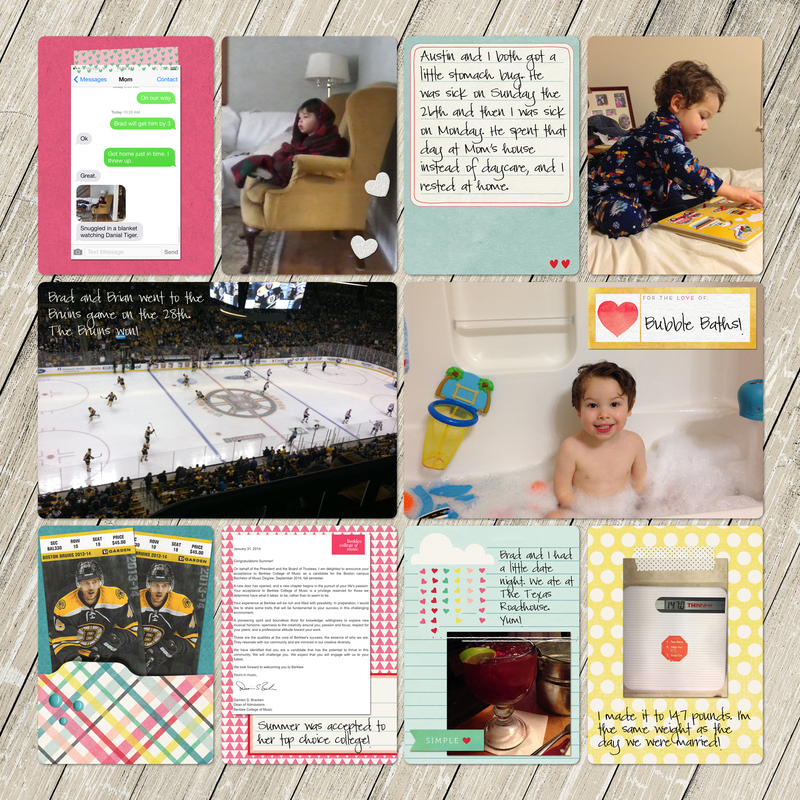 The journaling card about us having the stomach bug is from Stolen Moments. Over the photo of Austin in the bubble bath I added a label that I made from a larger frame from Pixels & Company. Summer was accepted to her top choice college on Friday (Berklee College of Music) so I asked her to forward me her acceptance letter so I could include it in the layout. I don't get too much of Summer into my Project Life album because she isn't with us that often, so it was nice to have this big moment for her added in. It isn't definite that she will go there yet (depends on financial aid and what her parents decide) but as it is her top school, it is a big thing. 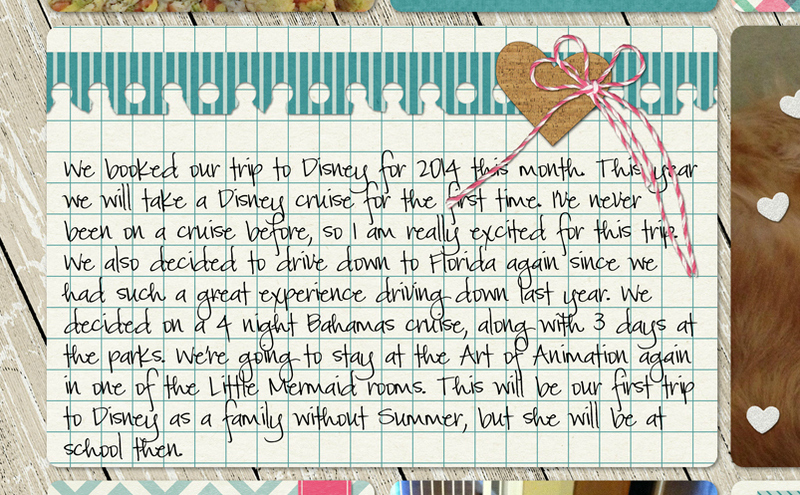 The pink patterned paper behind her letter is from Jennifer Labre and the label is from Just Jaimee. I used a journaling card from Mommyish and some paper from Deena Rutter in the bottom right pockets. It's a little hard to tell here but over the photo of my sangria I used some stitches from Creashens, and then a label from Deena Rutter. 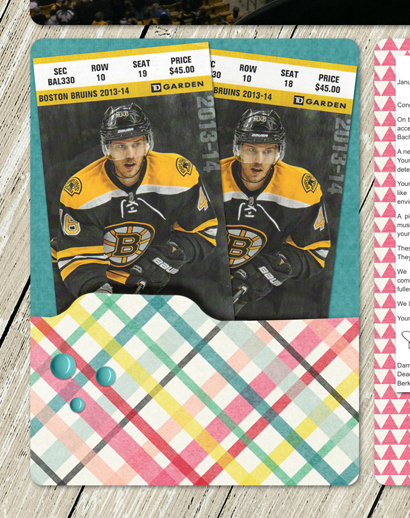 In the bottom left I wanted to include scans of the Bruins tickets from the game that Brad and my brother went to. This past week I bought some awesome pocket templates from Simply Tiffany Studios over at Pixels & Company. These are really cool, because each piece is it's own layer, so you can add your own journaling cards or tickets or memorabilia inside the pocket, and use your own choice of papers for the background and the front pocket. Really fun and really simple to use. This was the perfect way to include the Bruins tickets. I just added some enamel dots from Just Jaimee to the front of the pocket. My background paper is from Gennifer Bursett. I used my go-to templates from Cathy Zielske. My font is Pea C-Squared from Kevin & Amanda. I had so much fun creating this spread. Thanks for stopping by today and letting me share this with you. Please hop on over to Lisa's blog next! I love reading about your process and I have to try copying a part of a card like you did with the flag. Wow, what a great and detailed post. Love these layouts. I'll have to play with all of those DigiScrap Parade things I downloaded. You've inspired me! Love your work. Cheers!